APOSTLE OF SOLITUDE’s Of Woe and Wounds will rank among the heaviest album of 2014. From the 7-minute opener “Blackest of Times” to the ending “Luna,” APOSTLE OF SOLITUDE deliver an incredible performance that gives full sense to the sometimes-abused term “DOOM”. 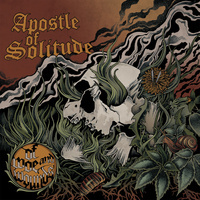 Mastered by Tony Reed (producer of last SAINT VITUS’ album “Lillie: F-65″), this album confirms APOSTLE OF SOLITUDE as a versatile, multi-dimensional doom band that offers the most Sabbath-inspired sound around these days, blended with personal, oppressive yet dynamic atmospheres such as those found in “Push Mortal Coil” or “Whore’s Wings” (re-recorded hits from their 2012′s demo), or the long and haunting “Die Vicar Die”. The album also features the extraordinary work of talented Artist David Csicsely known for his illustrations of Mournful Congregation, Solitude Aeternus, Wheel, Flight of Sleipnir releases. The double LP version contains two bonus live tracks, A2 poster, insert and download card.